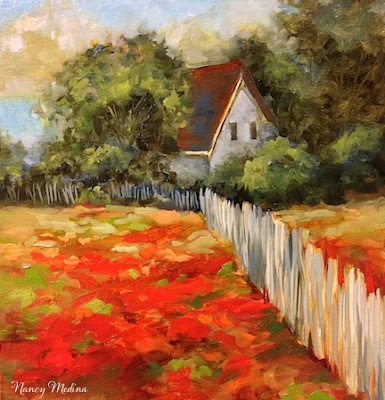 Indian Paintbrush Homestead is the newest work in Flower Mound Studio, and it's a scene directly from my childhood, and the fields of Indian Paintbrushes on the farm. We never had bluebonnets, but we had acres of Indian Paintbrush, my favorite wildflower. I used to pick one flower and carefully examine its shape - how its petals were so similar to bluebonnets, with their shape and size, but so distinctly different in color. When I stood in these fields, the smell of sage was strong, and there was always a breeze, and always in the summer the sound of insects and songbirds. My father made his own fence posts out of split telephone poles he had purchased at a bargain price, and he strung his own barbed wire using the John Deere tractor, or Mary Jane (the little red tractor), if John was in his shop for a repair. There was always so much to do in the summer months, with the planting and mowing and the care of the animals. He and Mom would get home from work and go straight to the fields during planting or harvest, and always on weekends, they were there working. It never occurred to me when I was young, but my parents must have had a real appreciation for the land, and of growing things. This is where my love of flowers and nature began. I don't have acreage or a garden here in this urban jungle, but I'm thankful that I have my canvas to create with paint what my parents loved and nurtured all the years of my childhood. I don't know how I knew but I had a feeling this was your childhood home. I always pictured it with the trees and bushes around it but the bucolic fields right near by. I love this piece, Nancy and I hope you keep this one just for yourself. This is my favorite of your cottage paintings! I see the "heart" in it!Technically wonderful, too.